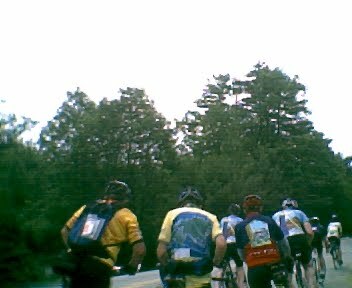 We had a better-than-anticipated ride in Readfield Saturday, as we were largely successful in dodging raindrops that weren't in the original forecast. While the skies tried to decide whether to pour or not, Frank led us on some short, improvised loops so we were never too far away from the ride start in case the skies really opened up. In doing so, he took us down some great roads that we hadn't been down before, and we had a lot of fun. Next Saturday's ride will be in Augusta, and it will include breakfast on the agenda. Last year's event was really well received, and you wouldn't want to miss it. To those of you doing the Trek, good luck, good weather, and Bon Route! "Capital Breakfast Ride" - a tour through the streets and past the features of our capital city. TERRAIN: moderate with some flat stretches riverside. HIGHLIGHTS: breakfast, the capital, the Kennebec close up, new and intriguing routes - and did we mention breakfast?